This course is important for workers in care homes and social care settings, providing all the information needed to support patients. 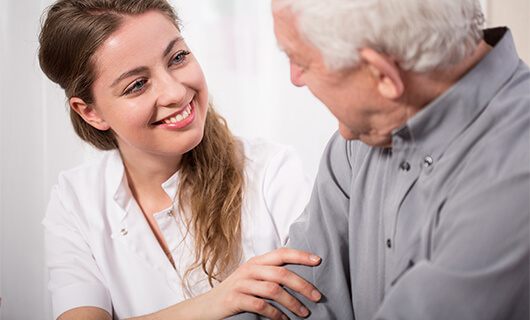 This course gives will give students an understanding of the causes, signs and symptoms associated with dementia and Alzheimer’s, including some of the problems of the brain linked with this condition. The session will be delivered by one of our highly experienced trainers coming from a healthcare background, which means that all of the information will be relevant and accurate. Together we will think about common problems that are related to Alzheimer’s and Dementia, including both communication and behavioural. This course will provide you with useful skills which will enable you to deliver a professional, caring service to all of your patients and their families. The duration of this course will be from ½ a day to a full day, depending on your existing knowledge of dementia and Alzheimer’s care. To improve the student’s understanding of Alzheimer’s and dementia so that they are able to support patients suffering with these illnesses effectively. The programme is ideal for any member of staff that works in a Health and Social Care setting, like care homes and hospitals, where cases of dementia and Alzheimer’s are common. This course is a great starting point for those looking to go onto study for NVQs or apprenticeships in Health and Social Care as it gives you the fundamental knowledge to start your learning. It is also useful for those who are the designated carer for someone suffering with the disease as it will help you to develop useful skills which will come in handy on a day-to-day basis.